The Georgian table is always filled with a vast array of salads and appetizers. Often at a Georgian restaurant, I don’t even make it to the main dish because I stuff myself on starters. This is one of the culprits. Mkhali (or pkhali) is a general term for a vegetable puree mixed with herbs and ground walnuts. Yesterday I made the version with beets. You could just as easily substitute spinach or other greens. This recipe comes almost verbatim from Darra Goldstein’s masterpiece The Georgian Feast: The Vibrant Culture and Savory Food of the Republic of Georgia, one of my all-time favorite cookbooks. 1. Wrap the beets in foil and bake them for an hour or so at 375° F. until tender. Allow them to cool, then grate them. 2. While waiting on the beets, grind the walnuts, garlic, and salt together in a food processor. Add the cilantro, parsley, pepper, summer savory, and coriander, and continue grinding to make a fine paste. 3. 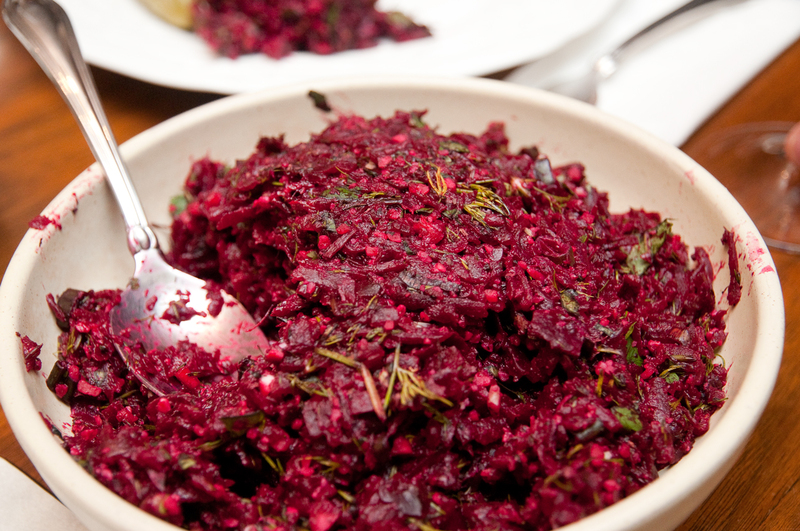 In a bowl, mix the grated beets and the ground walnut mixture and vinegar until well combined, then adjust vinegar as needed to make the dish slightly tart. 4. Chill in the refrigerator for at least 2 hours, and bring to room temperature before serving. OPTION – Spinach mkhali: Use 1 lb. of fresh spinach instead of the beets. Wash it well and cook, covered, in the water left clinging to the leaves until tender, about 5 minutes or less. Squeeze out excess moisture, then mince finely. Follow the directions as above, seasoning to taste. This entry was posted in Appetizers, Salads and Sides, Vegan, Vegetarian and tagged Beets, Georgian, Nuts by Baron. Bookmark the permalink.